I think a lot of people were asking the wrong question when they pondered whether 343i would make as good a steward of the Halo franchise as had Bungie. What I wanted to know was whether or not 343i could drag Halo out of the miserable hole that was Reach. During the first few months of Reach, you could wreck ¾ of the player-base by abusing armor lock. Then, the top players perfected their jet pack skills so that anyone who didn’t know how to fly-and-headshot was hopelessly outclassed. It made the game a lot harder to come back to if you have a life outside of playing Halo, because Bungie essentially doubled the amount of basic movement and control literacies that become rusty with disuse. 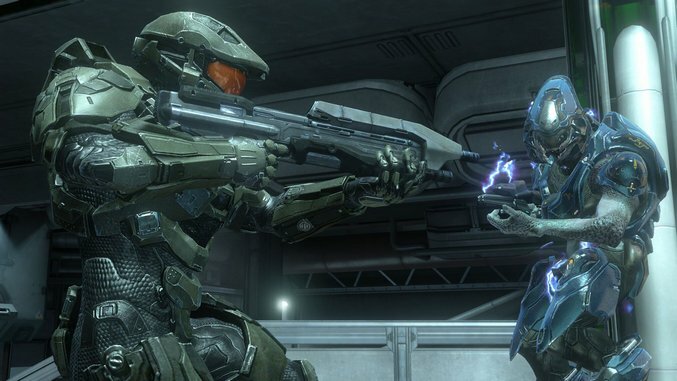 Many people are concerned about Halo 4’s new multiplayer progression system. In most of the match types, you have to customize your own loadouts. 343i made the ridiculous decision to lock many of your choices with a “Spartan point” currency system. It’ll take five hours to gain access to everything, then maybe another five to finally unlock it all. God knows how the armor specialization system works, because it was feature-locked during the review period. You need to select a primary weapon, a sidearm, a grenade, an armor ability, a defensive perk, and an offensive tactic. Pretty much everybody I played against during the review period went for what’s sure to be the “vanilla” build for the foreseeable future: battle rifle, magnum, frag grenade, shield recharge (defensive), and quick reload (tactical). Plasma pistols and grenades don’t feel quite as accurate as they once did. Armor abilities are a bit of a mixed bag, and everybody gets to sprint now, because it isn’t the mid-2000s anymore. The jet pack is slower and won’t get you as high, so it’s no longer the default choice for better players. The hardlight shield is a weaker, unidirectional version of the armor lock. Auto-turrets and regeneration fields are good for point defense, but they’re expensive to unlock and suffer from a slower recharge. Most people will sport the new Promethean Vision ability, and their decision is understandable. All things being equal, one-on-one fights in Halo come down to a single headshot; if you can see through walls, you’ll get the first shot off (and you can avoid 2-on-1 situations entirely). Ordnance drops and many of the new weapons are design decisions I could have done without. This is where the accusations of ripping pages from the Modern Warfare playbook hit closest to home. Every medal you acquire in a match contributes to an ordnance meter. When it’s full, you’re granted instant access to three random boons. These might be guns, grenades, or power-ups. They can be stolen after the drop if you’re killed or scared away by gunfire, but they appear so quickly (even indoors) that the risk-reward tension of calling in Call of Duty’s supply drops has been almost completely dissolved. The ability to drop in random weapons also shatters the fragile weapon ecology that all previous Halo games were based around. You used to know exactly where a map’s one rocket launcher would spawn. Understanding how to get there safely and quickly was part of learning the game. There was also a dramatic moment when you turned the corner near a weapon spawn, dreading the possibility that an opponent had beaten you to the chase. Now there’s a HUD overlay marking each special weapon at the beginning of a match. If it blips off the screen, there’s no longer a reason to go anywhere near the area. 343i’s choices have also introduced a large number of redundancies in the mix of old and new weapons. There are four medium-range rifles now. Four types of machine gun, only one of them useful (the new SAW). Of course, it always kind of sucked when someone would grab the only shotgun or rocket on a map. You’d have to wait for it to be used up and spawn again before getting your crack at it. But the beauty of it was that you knew the state of the map at all times. You knew that you had to act differently to account for the fact of an enemy wielding a Spartan laser or a sniper rifle. You’d count their missed shots, waiting for a chance to strike. In Halo 4 it’s entirely possible that every member of the enemy team will have a superweapon at any given time. You don’t know what they have until you see them, because everybody is hoarding ordnance drops that warp into their protected areas on demand. You don’t even know what your teammates have half the time. Gone are the thrilling moments of racing the opposing team to a teammate’s corpse in an effort to reclaim her discarded energy sword. If you get two more assist medals, your ordnance meter will fill, and you’ll spawn your own damn close-quarters weapon. So what’s the point? Now the game is more about improvisation than map control. That might be a good thing for some, but it’s likely to ruffle the feathers of the first trilogy’s loyalists. This isn’t an issue of accessibility and building new audiences, either. I don’t think multiplying the number of functionally equivalent weapons and upping the number of explosives helps a newcomer to the series. It makes everything a lot more chaotic and difficult to grok; I spent the first hour of my time with the game just trying to see past all the new beeps and doodads on my HUD (PS: when you see an expanding circle flash on your radar, it means someone just saw you with Promethean vision…you’ll thank me later). Some of the new weapons definitely fill unexplored niches in the game’s design space. The Promethean versions of the shotgun and the rocket launcher—called the Scattershot and the Incineration Cannon, respectively—are a bit better at medium distances because of their wider and more erratic blast patterns. The sticky launcher is 343i’s answer to the difficulty (and often suicidal results) of using a rocket launcher in close quarters; instead of having rounds that detonate on impact, it fires a red sticky grenade that can either be triggered remotely or left to explode after around ten seconds. The Spartan laser also gets a quicker, easier anti-personnel adaptation in the form of the railgun. 343i also added heavy weapon drops to wrap matches up if they’re about to run out of time before either team has hit its score goal. In the last minute of a Slayer or Big Team Battle match, rocket launchers and sniper rifles rain from the sky. At first I thought this was a kind of rubber-banding move to help the team who was behind catch up, but then a Binary Rifle—basically Counter Strike’s 1-hit, 1-kill AWP with a Halo-ized visible tracer—landed next to me in a match I was already winning. It’s a really messy over-correction to what I see as a non-problem: Are people seriously that upset when a match ends because of the time limit? You still unlock new cosmetic options by gaining experience levels, but now there are even more unique pieces available to those who can repeatedly score commendations related to feats like multikills, headshots, sprees, assists, or close-quarters combat. Many new medals have been added, toward the goal of recognizing different kinds of player achievement. The most ambitious one that I’ve seen is “Distraction,” awarded when a teammate kills an enemy who was shooting at you (if they return fire against your team or if you fire back at them, it nullifies the medal). While I could see this actually becoming a tactical move at higher levels, it mostly happens on accident. At certain points, it feels like 343i subscribes to the “everybody gets a gold star for effort” school of scoring. Probably the best decision to remove something from the game since Reach is the campaign scoring. The system was highly exploitable in Reach, leading to people grinding sections of the game for currency and armor pieces. You still have access to every skull from the beginning (which was a terrible decision for both games, seeing as the search for skulls was some of the most fun to be had with the campaigns of the original trilogy). But you might ask what the point of skulls is without the score multiplier, and the only answer is to have faith that 343i will regularly update the “challenges” playlist with quests to beat certain levels while some skulls are turned on. The removal of Firefight, on the other hand, is egregious. In ODST, this was a proper Horde mode based upon the slow addition of difficulty and combo potential via skulls; it didn’t have proper matchmaking, but if you could get a team of buddies together it was a minor revelation—finally a meaningful use of the skull system. In Reach, the Firefight system was broken a bit by being given an “ending” and a bunch of awful playlist options like “kill everything with infinite rockets.” Now all you get is Spartan Ops, which is episodic narrative content rather than a legitimate scoring match with your friends. Spartan Ops is about a baby supersoldier unit called Crimson that has to press four buttons, blow up three purple computers, and either headshot or explode 120 enemies in fifteen minutes. I haven’t mentioned whether the campaign is any good. And the answer is that I don’t really know. Its storyworld is indistinguishable from those of Starcraft and Mass Effect at this point. New Promethean Knight units make it a decent challenge on Heroic and Legendary difficulties, because you often don’t have access to a plasma pistol for their overshields. They also have binary rifles that can turn back five minutes of progress with a single shot. I found myself actually needing to use the crouch-and-sneak system for the first time because of this, so that’s something. Also, previously maximal decisions like hijacking a ghost or banshee are no longer tenable, because of the insane number of fuel rod cannons and plasma EMPs employed by the multitude of Covenant grunts. I know this might sound harsh, but it comes from a place of love. Halo 3 remains the high water mark of the series; however, it took Bungie a long time to get there. I don’t doubt that 343i can turn this ship around during the course of their tenure with the franchise. Nothing they’ve done here has irreparably broken the core of what makes a game Halo. It’s still the game where you need to jump and juke while shooting in order to survive, and it still rewards a dancer’s grace and improvisation in the face of overwhelming odds. It’s still the only competitive console shooter that anybody would ever want to play split-screen with their friends. But right now Halo 4 is too bloated and chimeric. Simon Ferrari is a PhD researcher of digital media and the philosophy of sport. He currently teaches film and videogames at the Georgia Institute of Technology.